This gorgeous little gift book from The Very Hungry Caterpillar is the perfect way to say "Happy Birthday!" Add a festive touch to your party with our colorful strawberry print napkins featuring the Very Hungry Caterpillar Napkins. Each pack contains 20 paper napkins. Napkins measure 6.5 inches by 6.5 inches. 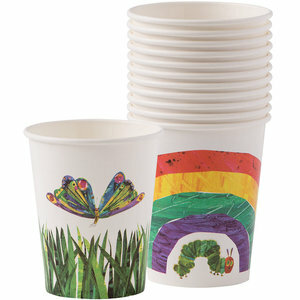 These festive Eric Carle cups are a must-have for every Very Hungry Caterpillar themed party! Each pack contains 12 paper cups featuring Eric Carle's iconic The Very Hungry Caterpillar under a colorful rainbow design and a beautiful butterfly over grass. Don't forget the napkins or plates to make your party table complete! 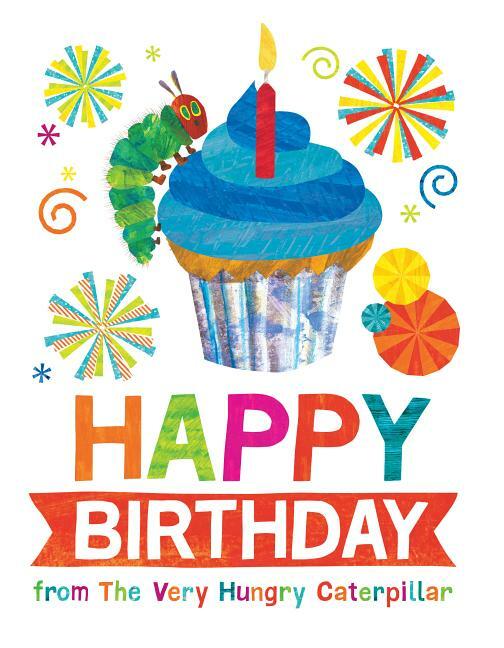 Celebrate in style with The Very Hungry Caterpillar! 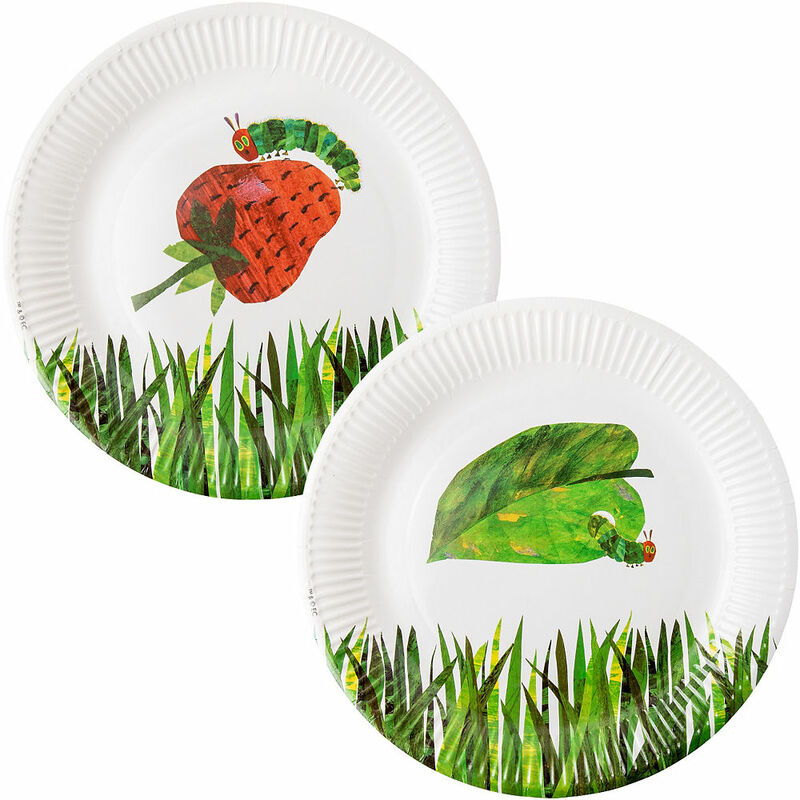 This set of 12 dinner-sized paper plates feature two classic designs perfect for any caterpillar cake, or fruits and snacks: the Caterpillar munching through a strawberry or a green leaf. An ideal addition to any party! With bright and colorful prints, this Very Hungry Caterpillar Garland will lighten up your caterpillar party in no time! Each garland has 16 paper pennants featuring the designs of a vibrant rainbow, multi-colored butterfly, and the hungry caterpillar with his yummy strawberry. Perfect for birthdays and other parties, or simply classroom or home decoration! 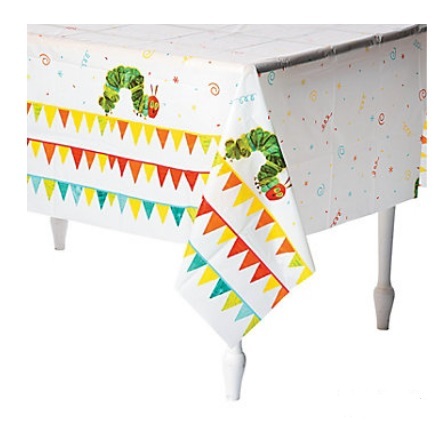 Measures approximately 10 feet long with 16 pennants and green ribbon. Essential for your Very Hungry Caterpillar-themed party! 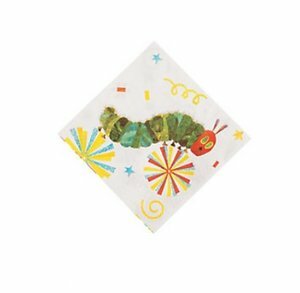 Set of 16 paper beverage napkins featuring Eric Carle's The Very Hungry Caterpillar. Measures 10". Throwing an Eric Carle party? Find more party supplies here. 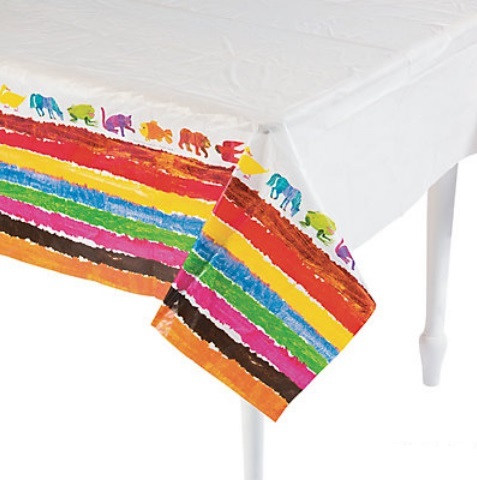 One plastic tablecloth featuring images from Eric Carle's The Very Hungry Caterpillar. A must-have for your Eric Carle party! Tablecloth measures 54" x 108". It's party time! 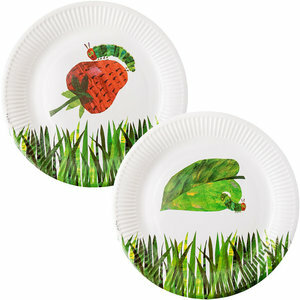 Set of 8 paper dessert plates featuring Eric Carle's The Very Hungry Caterpillar. 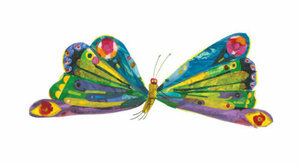 A must-have for your Eric Carle party! Plates measure approximately 7". Throwing a Very Hungry Caterpillar party? Find more party supplies here. Set of 8 festive paper cups featuring Eric Carle's The Very Hungry Caterpillar and the text "Hooray!" A must-have for your Eric Carle party. Cups measure approximately 3 3/4" tall and hold 9 oz. 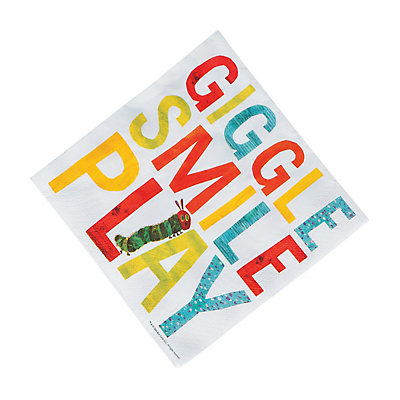 Brighten up your party with these festive Very Hungry Caterpillar napkins. 20 paper napkins in a pack. 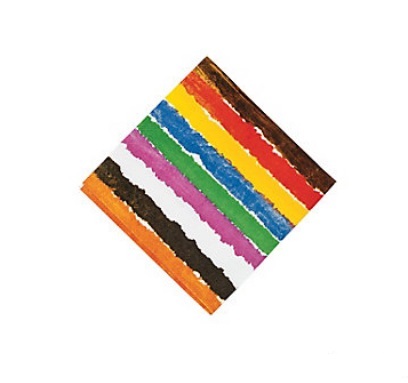 Each napkin folds out to reveal Eric Carle's The Very Hungry Caterpillar with a colorful striped border. Standard dinner napkin size. 6.5" x 6.5". This pack contains 12 bowls in total in two different designs. Perfect for snacks for a very hungry caterpillar party! Bowls measure approximately 6.5" wide x 2" deep. Set of 16 festive large paper napkins perfect for your Very Hungry Caterpillar party! Luncheon sized napkins measure approx 13". Set of 8 paper plates featuring Eric Carle's The Very Hungry Caterpillar. A must-have for any Eric Carle-themed birthday party, baby shower or festive occasion. Large lunch sized plates measure 9". Set of 8 paper plates featuring The Very Hungry Caterpillar. The perfect addition to any birthday party, baby shower or festive occasion. Plates measure 8". Essential for your Brown Bear-themed party! Set of 16 paper beverage napkins featuring the colorful endpaper stripes from Eric Carle's Brown Bear, Brown Bear, What Do You See? Measures 10". Throwing a Brown Bear party? Find more Brown Bear-themed party supplies here. One plastic tablecloth featuring images from Eric Carle's Brown Bear, Brown Bear, What Do You See? A must-have for your Eric Carle party! Tablecloth measures 54" x 108". 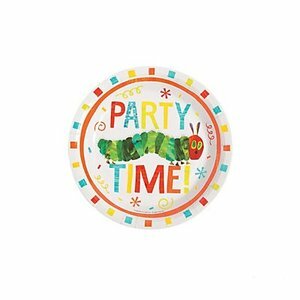 Let your birthday party guests know The Very Hungry Caterpillar is coming to your party with these adorable Caterpillar invitations! Each pack has 12 postcard-style invites and coordinating envelopes. Combine these with the Hungry Caterpillar Thank You cards to make your birthday party perfectly caterpillar from start to finish! Postcards measure 4.25 inches by 5.75 inches. Set of 3 mylar balloons featuring Eric Carle's The Very Hungry Caterpillar. 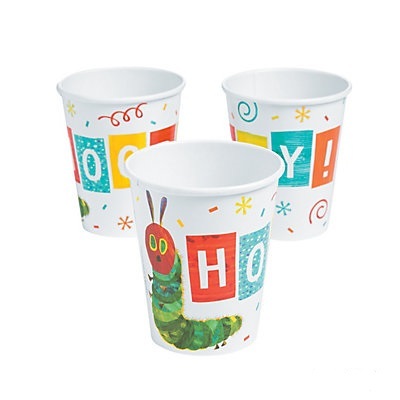 The perfect festive decoration for birthday parties and Eric Carle-themed celebrations! Balloons measure approximately 16" x 16". 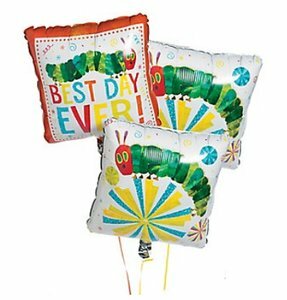 Set includes 1 double-sided Best Day Ever balloon and two double-sided Caterpillar balloons (same image on both sides). Balloon string is not included. Featuring the nice and full (after your party!) Caterpillar himself, and a simple colouful ‘Thanks’ print, each of the 12 postcard style notes has a matching envelope, perfect for rounding off your Very Hungry Caterpillar themed party. Combine these with the coordinating Caterpillar Invitation cards to make your birthday party perfectly caterpillar from start to finish! This Very Hungry Caterpillar Happy Birthday foil balloon is an eye-catching 17" when inflated. Perfect for your Very Hungry Caterpillar party! 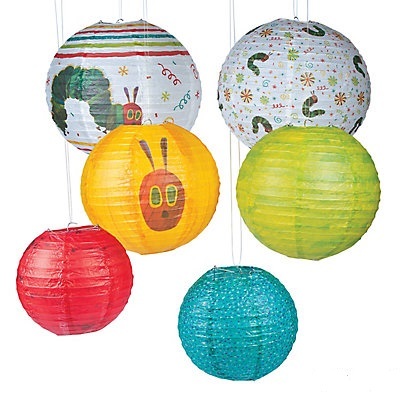 Set of 7 lanterns and stickers to create your own hanging Very Hungry Caterpillar decoration! Use these paper lanterns to get the party started! Great for a Very Hungry Caterpillar or Eric Carle theme, hang these lanterns up amongst the rest of your party decorations. Also can be used as classroom decorations! Six lanterns per set. Each set includes two each of: 8", 12" and 16" paper lanterns. Simple assembly required. Includes metal hangers. Create your own fun party photo booth with these festive Very Hungry Caterpillar photo props! Pack includes 10 dress-up props featuring lots of fun elements from Eric Carle's The Very Hungry Caterpillar. Set of 10 thank you postcards and envelopes.